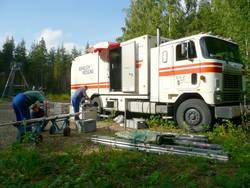 We help PI's of ICDP projects to develop and optimize a downhole logging plan for the individual scientific targets and conditions of their project. Our extent of help depends on the requests of the PI's. It can range from just providing information on time and availability for logging methods to the creation of an entire logging plan. The close in-house cooperation with our other OSG experts (drilling, core handling and data management) assures smooth and optimized operations. If desired we may also assist in the management of logging activities. Our participation in downhole logging operations is not mandatory. OSG consulting is free of charge for ICDP projects.